These mosaic tiles feature a whimsical garden viewed through the kaleidoscope. Re-create the initial image as this art will spruce up your space with its bold hues! CONs: Your breakfast may get cold. 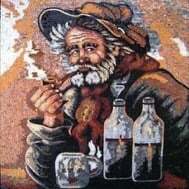 This stunning handmade mosaic art is perfect as a mural for any office, bedroom, living room, dining room or retail space. Our mosaics are made from natural marble and stones, naturally resistant to different environments (dry, moist or wet) and weather conditions (frost, sunlight or extreme heat).